By Lawrence Olaoye, Lateef Ibrahim Abuja, Lawal Sa’ idu Funtua, Katsina, Oluseyi Dasilva Kwara and Femi Oyelola, Kaduna. fact been taken to Federal Medical Centre, Katsina, but the news came nonetheless as a great shock. “During the long period of military rule, he was in the main part of the Federal Judiciary culminating in his being appointed President ofthe Court of Appeal from which post he retired voluntarily and honourably in 1992. “The late Galadima was one of the most astute public figures. He was ever ready to attend to any conciliatory assignments and had innumerable solutions to knotty problems. He seldom lost his temper and always looked at the positive side of things,” the President said. Galadiman Katsina, the country has lost one of its most respected and decent judges in its history. Similarly, Governor Aminu Bello Masari of Katsina State has expressed extreme sadness over the death of the Galadiman Katsina and District Head of Malumfashi, Justice Mamman Nasir, saying that Nigeria has lost one of its last standing illustrious sons. 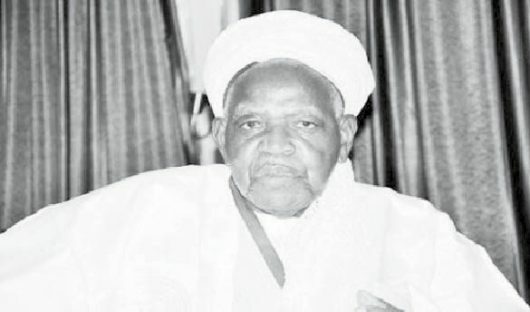 In a statement signed by his Senior Special Assistant on Media, Abdu Labaran Malumfashi, Governor Masari described the late jurist as one of the leading conscience of the nation, who led an exemplary life defined by uncommon patriotism in the tradition of his mentor, the late Premier of the North and Sardaunan Sokoto, Sir Ahmadu Bello. “The late traditional ruler and former jurist, whose professional career peaked as President of the Court of Appeal, was a rare gem, and his death has created a wide leadership chasm that may take a long time to fill,” he added. He extendied condolences to President Muhammadu Bujari, the Emir of Katsina, Alhaji AbdulMumin Kabir Usman and the family of the deceased on behalf of himself, the government and people of Katsina state. The Emir of Ilorin and Chairman Kwara State Traditional Council, Alhaji Ibrahim Sulu-Gambari, has also described the demise of the renown retired President of Appeal Court, Justice Mamman Nasir, as a great loss to the nation. The emir in his condolence message signed by the National Secretary of Shehu Alimi Foundation for Peace and Development, said “His Lordship, late Justice Mamman Nasir will remain in the hearts of Nigerians forever. The chairman Council of Yoruba Traditional Obas and Chiefs in the 19 Northern States and Abuja, Ambassador Mohammad Arigbabuwo has said the death of Justice Mamman Nasir, the Galadima of Katsina and former President of the Court of Appeals, is a monumental loss to the Nation. He made the assertion while speaking to the media in Kaduna yesterday. According to him, late Justice Nasir was a legal icon and courageous jurist, who served the country meritoriously and contributed immensely to the development of the law and independence of the judiciary.